In 2009, Amy Hoh received the best present of her life - independence. For Amy, Service Dog Cortez has granted her the gift of independence, mobility, and unconditional love through his training at Circle Tail. Cortez may retrieve an object that is out of reach, open a door, or provide a nudge to Amy's leg so she will check on her diabetes. For Cortez, Amy is able to give him a long-lasting partnership full of adventure, work, and most importantly - love. Roger Dees was partnered with his in-home assistance dog Esa in the summer of 2010. This life-long relationship has given both Roger and Esa a sense of independence and purpose. In-home assistance dogs are trained to assist people with disabilities within their homes. These dogs may retrieve objects, open and close doors, or tun light switches off and on. Roger and Esa are equal partners in their journey toward independence and unconditional love. The Inmate/Canine Educational Training Program began in September 1998 to help provide trained dogs for adoption and assistance dogs to individuals with disabilities. Under regular instruction by Circle Tail, inmates care for and train the dogs and puppies that are in the program. "My best memory was when Circle Tail brought me a pregnant dog named Lena that I agreed to take and care for. Lena had 12 pups in my cell. It was the first time pups were born in that prison! It was a hot summer in the cell and I missed chow a lot, but I wouldn't change the experience for anything!" - Victor E. Addis, Jr.
That summer, Circle Tail saved more than just the lives of Lena and her puppies. Read Victor's & other inmate handlers' stories here. 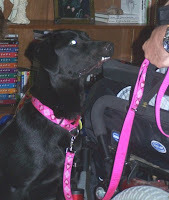 Read more stories about the Circle Tail dogs and the people whose lives they change at http://www.circletail.org/. Please consider supporting Circle Tail, Inc. and people like Amy, Roger, Vincent and Abigail through a tax-deductible, charitable gift. Please make checks payable to Circle Tail, Inc.
To donate online, visit http://www.circletail.org/ and click the “Donate Now” button. We and the Circle Tail dogs truly appreciate it. and provide trained dogs for adoption.